Carolina in the Fall™ … thinking about it conjures up images of brilliant colors and cooler temperatures. A time when life slows down and nature’s beauty speeds up! With that as a backdrop, Carolina in the Fall™ brings “New Carolina Music” to the foothills of North Carolina. Heart of Folk, LLC is proud to announce a new (but not so new) music and food festival. On the old Courthouse Square in historic downtown Wilkesboro, the Kruger Brothers will host some of North Carolina’s best folk/ roots music bands. They will be joined by bands from other areas that tip their hats to the rich musical history of Wilkes, the heart of American Folk Music™. This year’s line-up includes The Kruger Brothers, Rhonda Vincent and the Rage, Balsam Range, The Secret Sisters, Mipso, Barefoot Movement and many others. Destined to become an annual pilgrimage of bluegrass and folk music lovers from around the nation, Carolina in the Fall® will be held the last weekend of September each year. In addition to great music, those that attend will be treated to some of the State’s best food as each year food trucks from the region will bring their secret recipes to feed the masses and vie for the Carolina in the Fall™ Food Truck Championship trophy. Additionally, local vineyards and regional craft beer breweries will be onsite to provide a taste of the region’s best beverages. Make plans now to be in Wilkes on September 25th and 26th to enjoy the sights and sounds of the season of Carolina in the Fall™. Click (here) to purchase tickets. Click (here) to make your hotel reservations. If you like to camp click (here) (Sewerfest will be open!). If you want to purchase reserved seating at the Carolina Jam™ sessions each evening from 10 PM til Midnight at the Yadkin Valley Event Center click (here). We tip our hats to a great festival by the same name from a few years ago. Held on the Shepherd farm in Wilkes County, Carolina in the Fall™ introduced our region to the music of the Kruger Brothers. Robert and Brenda Shepherd hosted the festival and gave the brothers a place to call home. And as the song goes… “in the hills of Carolina folks have opened up the door and for the first time in my life I’m not a stranger anymore”. Come and join the community of music and food lovers… no strangers here. Save the date and make the annual pilgrimage to Wilkes, the Heart of American Folk Music. 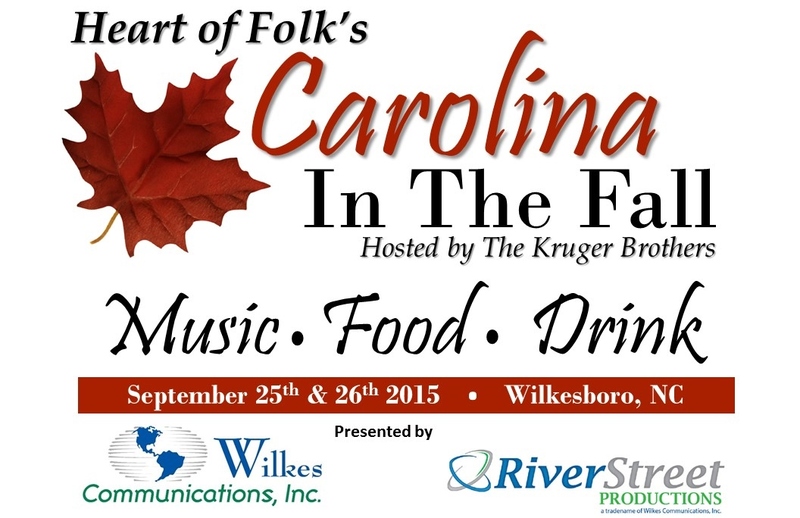 Carolina in the Fall™ is presented by Wilkes Communications, Inc. For more information, visit carolinainthefall.org.